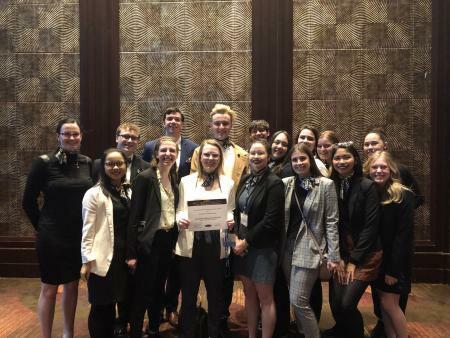 Western Washington University students traveled to New York City on March, 24 to participate in the largest National Model United Nations Conference in the world. The Western Washington International Affairs Association sent 16 students to the conference to represent the Lao People’s Democratic Republic. The students received five individual awards as well as a Distinguished Delegation Award that was presented to the team. The individual award winners include Célia Champion of Nantes, France; Tanner Sprankle of Fairbanks, Alaska; Juliet Knowles of White Salmon; Pauline Elevazo of Maple Valley; Adah Barenburg of Coupeville; Bryant Donner of Monroe; Sarah Jane Bentley-Spring of Tacoma; Jordan King of Coeur d’Alene, Idaho; and Levi Eckman of Vancouver. The team is advised by WWU Political Science Professor Cynthia Horne. The Model United Nations Conference held in New York City hosts more than 5,000 university students from around the world. The students have opportunities to meet with representatives from UN Member States and watch sessions held at the UN headquarters. Western’s President of the Model United Nations, Juliet Knowles of White Salmon, said the students gain valuable life skills at the conferences. Western’s Sarah Jane Bentley-Spring of Tacoma had the opportunity to speak in the UN General Assembly Hall while delivering a short address about sustainable development goals. "I’m always reassured and inspired seeing people my age speak about what they believe in and I was really honored to be a part of that at the UN,” Bentley-Spring said. The current president of the General Assembly of the United Nations, María Fernanda Espinosa Garcés, is currently having her staff read resolutions written by the students who attended the conference. For more information about WWU’s delegation to the 2019 National Model UN conference, contact Knowles at president@wwuiaa.com.